Family Pet Shows, owned by Garri Promotions of Huntington, N.Y., has acquired the Connecticut Pet Show from Jenks Productions. For the past 25 years the Connecticut Pet show has been produced by Jenks Productions based in Hartford, Conn.
“We have been waiting to find the right person and company to take over our pet show, and we are very happy that the Garetano family at Family Pet Shows will continue with and certainly grow the Connecticut Pet Show,” said Dennis Jenks. The show will stay in Hartford but moving it to the XL Center, making the show pet friendly and at a larger facility to offer more to Connecticut pet lovers this coming fall. Family Pet Shows has been producing consumer pet shows for more than 20 years and currently have three shows in Pennsylvania: Greater Philadelphia Pet Expo in Oaks Pa., Lehigh Valley Pet Expo in Allentown, Pa., and the Morgantown Pet Expo in Pennsylvania. 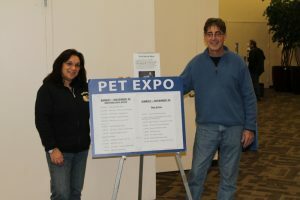 Two shows are also hosted on Long Island: Long Island Pet Expo in the Park, every September in Copiague, N.Y. and a larger show Long Island Pet Expo, every March at Suffolk Community College in Brentwood, N.Y.
All attractions of the November 2017 Connecticut Pet Show will be announced soon. Dennis and Karen Garetano, the show organizers, allow animal rescue groups that are official non-for-profit organizations to have a free space at all of their events and will in Connecticut as well. Animal rescue groups at the shows offer public information, education on responsible pet ownership and care.